The City of Fremantle acknowledges the Whadjuk people as the traditional owners of the greater Fremantle/Walyalup area and that their cultural and heritage beliefs are still important to the Nyoongar people today. The land around Fremantle (Walyalup) has always been a significant place for the Whadjuk. Walyalup was the country on both banks of the Derbal Yerrigan (Swan River). The story of how the land once extended past Rottnest but had been inundated by the sea is one of the oldest oral traditions in human history. The City of Fremantle sits within the Aboriginal cultural region of Beeliar. Its Nyoongar name is Walyalup (the place of walyo) and local people are called Whadjuk. The Beeliar district is bounded by Derbal Yerrigan (mouth of the Swan River), the Dyarlgarro (Canning River), Katamordo (Darling Ranges) on the east, the Wardan (sea) to the west and by the line due east from Mangles Bay on the south. To the local Whadjuk people, Fremantle is a place of ceremonies, significant cultural practices and trading. Fremantle has several significant sites and features in traditional stories. The mouth of the Swan River is the place where the Wagyl fought the Crocodile spirit and used the crocodile’s tail to separate the fresh water from salt water. There is also a strong connection to Rottnest Island (Wadjemup or place across the sea). 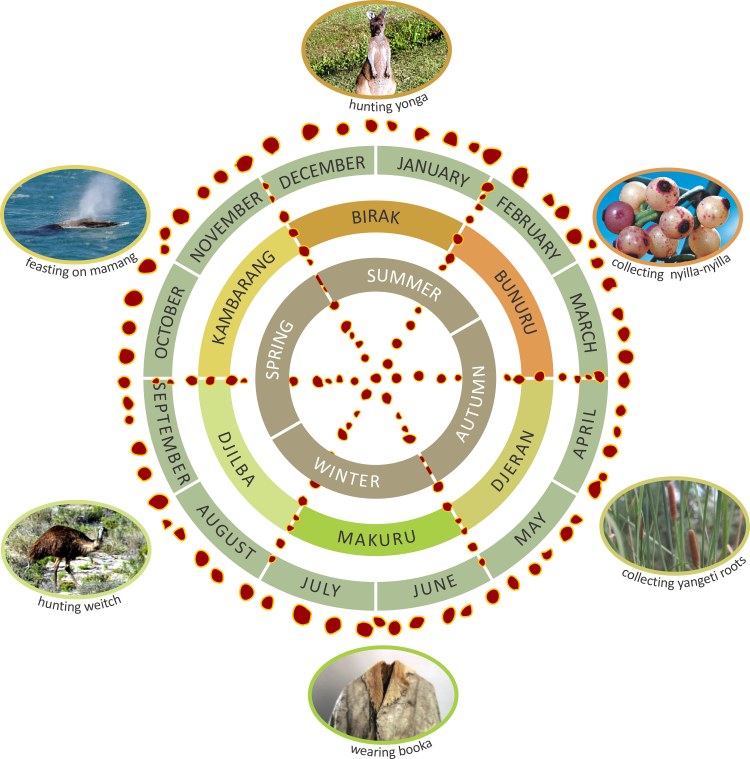 The Whadjuk identify six seasons which guided their movement across the land. For instance during Djeran (cool weather April to May) families moved back along the Swan River away from the coast. When Makuru (cold and wet June to July) came the Whadjuk moved further inland to their winter camps. By the time of Kambarang (warm and rain decreasing October to November) the Whadjuk had started to move back to the coast as the weather warmed up. The names Whadjuk people give to places conveys a sense of place. Derbal Yerrigan Derbal = this is a noun meaning mouth or in this case estuary. Yerrigan = this is a verb which means to flow or rise and fall. Therefore, Derbal Yerrigan refers to the estuary and flow of water where Fremantle harbour is now located. Walyalup (pronounced as WAL – LYA – LUP) is a noun because it is a naming word of a place. However, it is also an adjective in the sense that it describes an action that takes place with this naming word. It does not cover the entire local government area of Fremantle just the High street precinct to the Fremantle Town hall. So why is it called place of the walyo? The local Whadjuk people used to hunt walyo (kangaroo rat or woylie). Walyo were abundant in the scrub and low trees that were found around Fremantle. Beeliar is the name of the country on which Fremantle is situated on. Beeliar is one of the land divisions of the Whadjuk people. It stretches from the Derbal Yirrigan at Walyalup (Fremantle inner city) and east to Dyarlgarro (Canning River) south along the river to the Garangara (the Darling escarpment just south of Armadale) then west across to Derbal Nara (Indian Ocean) or Marmum Wardan (Father Ocean). The area was traditionally covered with lakes, water holes, swamp, marsh lands, with sand plains and hills providing a rich environment for plant and marine life. During the seasons of Kambarang, Birak and Bunuru – Beeliar would have provided a large variety of food resources for the Whadjuk people during the warmer months of the year along the coastal plain. For further information on Aboriginal history, records, culture and programs visit the Walyalup Aboriginal Cultural Centre.